In the final season of the amazing TV show The Office, Andy Bernard drops one of the most heartbreaking lines of all time when he says “I wish there was a way to know you’re in the good ol’ days before you’ve actually left them”. Folks, right now, we are in the good ol’ days of FC Cincinnati. This is a sports story that will live on in this city for generations. In fact, this is a tournament run that will be forever remembered in the history of the U.S. Open Cup around the country. An upstart team in Cincinnati, in only its second year, went on a run that included defeating two MLS clubs and the best the NASL had to offer to make it to the semi-finals. What FC Cincinnati just did is what every single lower division club has hoped for since at least 1996. That is a victory in and of itself. The world took notice of this team. 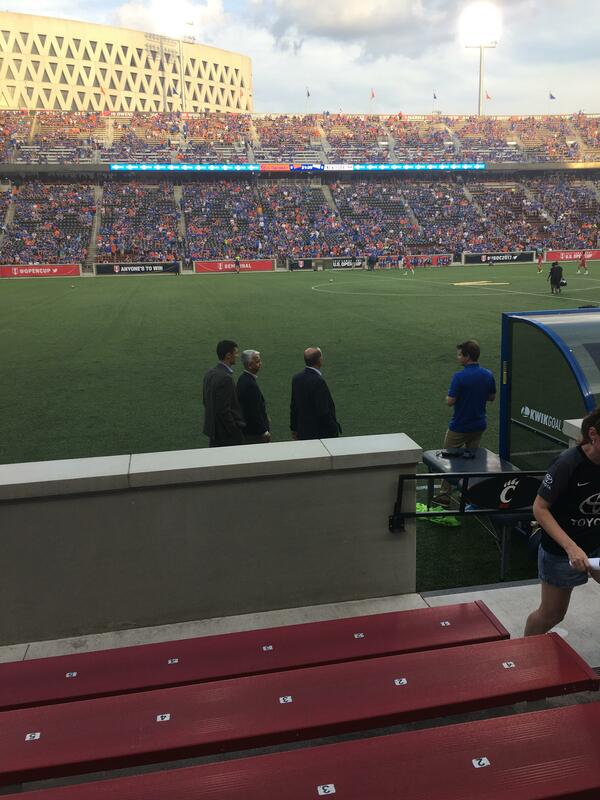 MLS Commissioner Don Garber and USSF President Sunil Gulati were in attendance last night. That is not normal. Regardless of the score line, this team exceeded even the most optimistic goals. It is hard to put into words how it feels coming off of the loss last night. Everyone knew we did not have a shot at this. Everyone knew we were going to get scored on. Everyone knew what Bradley Wright-Philips and Sacha Kljestan were capable of. Our team suffered their worst loss in club history just four days prior. And yet, this defeat stings. When you walk into a stadium with absolutely no hope for a victory, I suppose it was only fair that we started dreaming up 2-0 with 15 minutes to play. 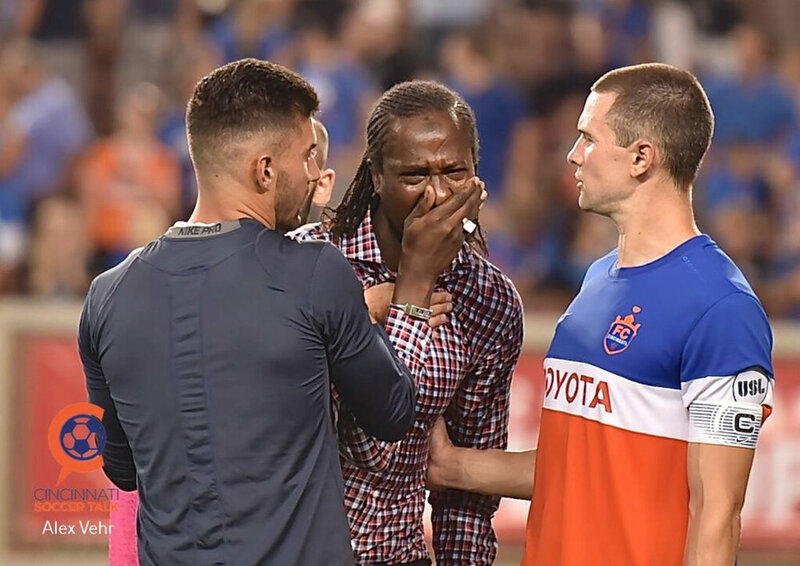 But nobody felt this defeat like Djiby. A man that carried this team, no this city, on his back in this tournament, was only unable to play thanks to an oversight in the rules by USSF. His emotion on the field was that of a player who put everything out there for his team, our fans, and this city. There are still, still, people online who claim he is a lazy player or wish they saw more out of him. I hope they saw last night the tears and pain in his face after that loss. That is a player any club anywhere in the world would be happy to have. Now some people have tried to connect this defeat with other sour moments of playoff history in Cincinnati, but there is no comparison. This was a resounding success, and anyone who tells you different is a dirty liar. If UC basketball lost in the final four last year, would it have been a disappointing tournament? If the Bengals lost Andy Dalton in the playoffs, only to lose the AFC Championship, would it be a failure? The fact that a Cincinnati team won five games in a single tournament is something that has not been done since the last time the Reds won the World Series. Regardless of the loss last night, this team won. Nobody can say anything that will take that away. Cincinnati, hold your head up high today. You did the sport of soccer proud last night. A sell-out crowd that embarrassed the national cable channels that decided to air documentary re-runs instead of the most compelling story-line in sports. The tifo was absolutely on-point, and a special thanks to all of you who sacrificed your evenings this past week to pull off that display. And the fans in the main stands were starting powerful, booming chants that are a rarity in MLS stadiums. Was anyone sitting down after halftime? Hats off to everyone. And not least of which is the team. This team has so many likeable players that are different fans’ favorite players. This team put everything out on that field last night. The fact that FC Cincinnati forced extra time with the New York Red Bulls is a testament to the talent and hard-work these players have shown us over the last two years. I was critical of coach Koch early in the year, but bravo sir. Koch went toe-to-toe with one of the best managers in US Soccer and damn near pulled off the impossible. Had his contract had not just been extended; I would say the contract ought to be in front of him this morning. So while the loss hurts, FC Cincinnati has set the town on fire. A remarkable story and tournament that reminded us what it was like to root for a winning team. To root for a team with lofty aspirations. To root for a team that wants to do the city proud. To root for a team that can win tournament games. To root for team that does not tell fans “we’re not going to compete for a few years”. To root for a team that shows how far we have come in a short amount of time as a community. We may have lost the battle last night, but we decidedly won the war.